Newcomer at Lakme Fashion Week, Nachiket Barve channelled Greco-Roman goddesses through his lehenga line consisting of contemporary pieces with hints of tradition. The colour palette focused on deep blue and burgundy with a little of black all embellished with gold and copper. While many ensembles were daring for a bride, we do love the edgy designs! This feminine line was full of flowy fabrics, pastel colours and sparkling embroidery. The silhouettes took inspiration from the Victorian era with corset-blouses, ballroom styling, elaborate feathers and fringes and of course, the delicate, feminine colours. 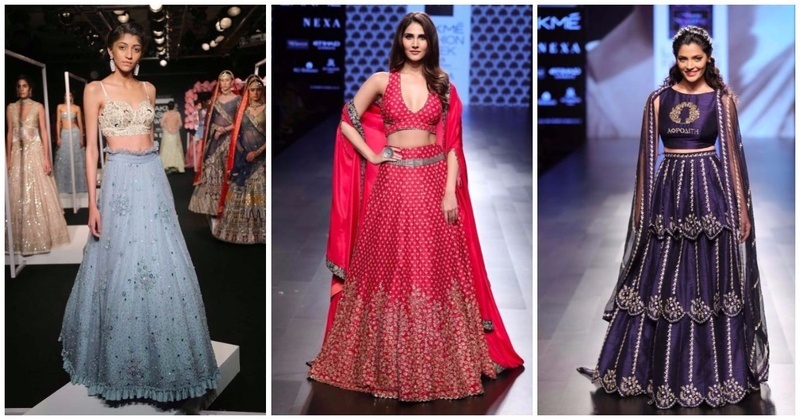 This collection is ideal for a bride or bridesmaid who doesn’t want to stick to your typical red lehenga! Sonam and Paras Modi brought Kashmir to the runway with their contemporary ethnic wear featuring motifs from the region’s flora and fauna. The stunning silhouettes came to life in sheer, velvet and silk with various embroideries and detailed prints. Ensembles primarily consisted of trendy lehenga-cholis and mod sarees.